Poetry from the Dark Side Book Ready for Purchase! From the Poetry pages (poetrypages.com) comes the darkness, the twisted dreams of fiction and fantasy, the phantom poetry or wrath and retribution. 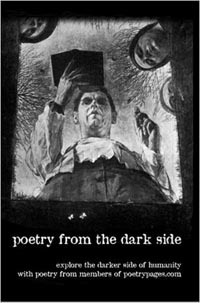 The Poetry from the Dark Side book is now ready to purchase through Lulu.com. Last edited by Berlie on Thu Aug 25, 2005 2:22 pm, edited 2 times in total. Sweet picture on the cover. "Being smart is a good thing... it's the dumbasses that make you think twice about it." Its now listed at Amazon.com. Also just showed up in the database at Barnes and Noble but not ready to purcahse online from them yet. But you should be able to order it through your local Barnes and Noble store now. Showing up for sale at Barnes and Noble.com now. Also got Amazon to add the cover art and book description. noblehouse is another version of poetry.com. Are we going to get volume III out soon?? I wanna be a part of it if we are!!! I won't be starting the process for Vol III until after the New Year. Ooh ooh, pick me pick me... (I thought that would be kinda cute with the smilie) No seriously though, I'd loveto be included in the next book, so if there is some specific process I must go through to achieve that, please let me know. Also, I work in the publishing department of a large consulting firm, so if there is anything I can do to help (ie. scan stuff in, adobe web, etc.) get ready for the next one, let me know. I'd be more than happy to set aside some time. I'm guessing you send a bundle of stuff off to a publisher somewhere, but I'm offering help in the process of getting the bundle ready to go. Anyhow, let me know if you wanna out me to work! Behind this pretty smile is a story you'll never understand. Start looking for information about the next volume after the New Year. I won't even start thinking about it until then. May be a little late in getting it started this year since it will be a busy time, start my new classes in jan and we are also starting to look for a house and will likely be busy with that about then too. Also need to finish up the Haiku book before I start in on the next volume of this. Can I be in Volume 3? I guess I have to write some good poetry first, eh? Well, when Volume III gets up and running, I'd like to post my plea to be in it as well.